Located on the south bank of the Merrimack River before it empties into the Atlantic Ocean, Greater Newburyport MA was originally inhabited by the Pawtucket Indians. Later, in the 1630’s, European immigrants settled here, founding the city of Newbury MA. The small port of Newbury quickly became a popular fishing and trading center, with the rest of Newbury turning to agricultural pursuits. By 1764, the port was so prosperous and densely settled that it broke off from Newbury to become the city of Newburyport.. Maritime trade fueled the city’s economy, sparking extraordinary building activity in the decades following. Newburyport thrives today thanks to an inspiring history of ship builders, merchants, and industrialists. But it took a village and an historic movement to save our amazing backdrop. 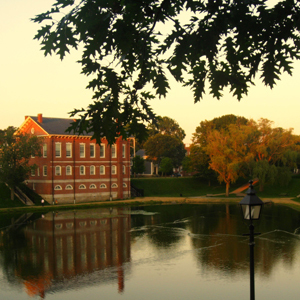 Visitors who travel to Greater Newburyport with a curiosity for its history and culture are greeted with much to discover and enjoy. 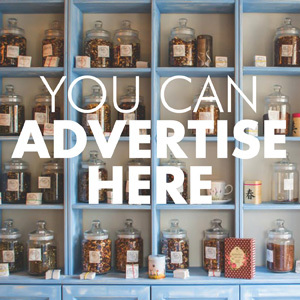 If you relish in studying historic documents, visiting historic sites, and seeing historic architecture, there are plenty of things to do in the Newburyport area. In 1811, a catastrophic fire leveled the downtown. That event, coupled with restrictive federal trading policies and embargoes implemented in response to the War of 1812 and the national financial panic of 1816, resulted in the city’s economic downfall. Ironically the 1811 fire led to stringent fire safety building codes, which helped in the preservation of the handsome brick facades you can still see in downtown Newburyport today. In 1851, the city annexed portions of Newbury and incorporated into a city. 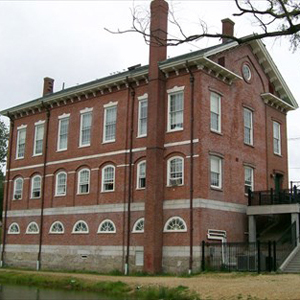 At the same time, technological innovations led to steam powered mills and provided a financial boost to the city. Many of the large red brick mill buildings scattered throughout Newburyport were built in this time period. By the early twentieth century, Newburyport had gone into another decline and many remember the slumbering town of the 1950’s. In the 1970’s the city launched an extraordinary urban renewal project that transformed Greater Newburyport’s decaying downtown and waterfront buildings into a picturesque brick and cobblestone retail center with an attractive waterfront park and boardwalk. Many traces of Greater Newburyport’s past can still be found. Churches and cemeteries evoke remembrances of local personalities. The Tannery district is an extension of old steam mills and tanneries of the past, located just outside downtown Newburyport. There were also ropewalks, clamming shacks, and many shipyards. Hundreds of original Victorian houses, colonial houses, and federal Newburyport mansions are still cherished by today’s homeowners, helping to draw visitors from around the world who want a peak into the past. In 1655, Captain Paul White built the first wharf on the 177-mile long Merrimack River. Since then, it’s been used in many ways over the years: as a conduit for food and transportation for Native Americans, a commercial port in the colonial town, a protected harbor during the Revolutionary War, and a center for privateers and shipbuilders during the War of 1812. It was the source of water that powered the Industrial Revolution, and a place to launch ships for 100 years. Although each of its services to the town was successful, the Merrimack River gained special importance as the base of operations for Newburyport Privateers, privately owned vessels licensed to attack enemy shipping. Newburyport privateers captured hundreds of British vessels during the Revolution and the War of 1812, but suffered heavy losses themselves. Vessels from all over the world registered their cargoes with the port surveyor at the Custom House of Newburyport. They brought cloth goods and hardware from Liverpool, wine from Madeira, gunpowder from St. Petersburg, and molasses and sugar from the West Indies. Ships built in Newburyport brought much wealth and prestige to their owners. 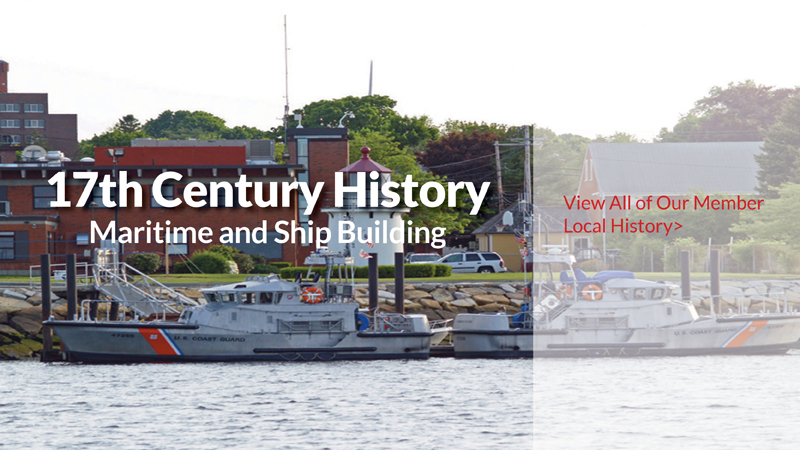 In the Newburyport shipbuilding district, ships were built well into the late 1800’s. The Currier yard built 97 ships, as well as barques and schooners. High Street mansions recall the names of those who made and lost fortunes in the maritime trade, such as Cushing, Bartlet, Greenleaf, Marquand, Prince, Tracy and others. In 1844, Donald McKay introduced clipper ships, and the last square-rigged ship built in Massachusetts was launched from Newburyport MA. Newburyport Mass. became an official Coast Guard City in August 2012 in recognition as its official birthplace. For over 100 years, and to this day, the Coast Guard has plied the waters of the Merrimack River, beginning as revenue cutters that enforced navigation laws. Today they rescue and supervise boats and yachts that have difficulty navigating the “most dangerous river mouth on the east coast.” Increasingly, the Coast Guard functions as an important national security force. You can spot three lighthouses erected by the US Coast Guard on Water Street and Plum Island. The Lighthouse Preservation Society is restoring the Range Lights. To help, call 1-800-727-BEAM to make reservations for dinner for two at the top of the Water Street lighthouse. 26 Pleasant Street, Newburyport MA 01950 978-465-0602 The church building was constructed in 1801 by the First Religious Society, which was founded in 1726. It has been suggested that noted Salem builder Samuel McIntire designed the building. 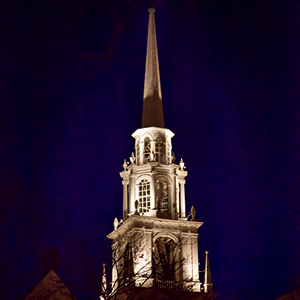 This place of worship was added to the National Register of Historic Places in 1976. 145 High Street, Newburyport MA 01950 In 1804 Newburyport was ranked as one of the wealthiest cities in the United States, mostly due to the thriving shipping trade. In this year the townspeople authorized the building of a new courthouse and hired American architect Charles Bulfinch to design the structure and supervise its construction. High Street, Newburyport MA 01950 Located near the Newburyport Superior Court House, the ancient glacial kettle hole is a jewel in the crown of Newburyport.The Mall, also known as “Frog Pond,” was modeled after London’s Pall Mall and is a popular destination for dog walkers, families feeding the ducks, and skaters during the winter months. Brown Street, Newburyport MA 01950 978-465-7959 Walk through the Oak Hill Cemetery and you’ll find the gravesites of clipper shipbuilder Donald McKay; authors; past mayors; and other prominent citizens. 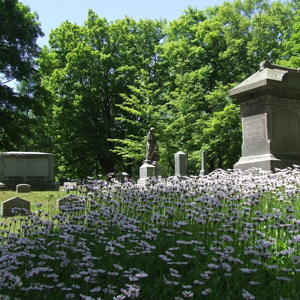 Consecrated in 1842, Oak Hill Cemetery is one of the first rural garden cemeteries in the United States. 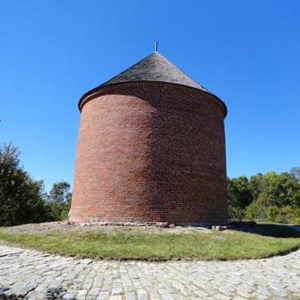 57 Low Street, Newburyport MA 01950 978-462-3459 The c.1822 Powder House, located a safe distance from the homes of the era at Goff’s Hill off Low Street, stored gunpowder, flints, musket balls, and camp kettles used by the local militia to defend the community.